The ongoing decline in tax receipts has worsened state budget problems. At least 48 states addressed or are facing shortfalls in their budgets for the upcoming year totaling $166 billion or 24 percent of state budgets. New data show a majority of states expect shortfalls in 2011 as well. Aggregate gaps through 2011 likely will exceed $350 billion. Most states start their fiscal year July 1 and have either adopted budgets for fiscal year 2010 or will do so shortly. In doing so, they have used federal stimulus dollars, cut spending, raised revenues, and drawn down reserves. Indications are that the budgets taking effect July 1 will not long be in balance because of continually eroding revenues. As of the last week in June, two-thirds of the states have adopted budgets for 2010 and already 12 of these states face new shortfalls totaling $23 billion before the fiscal year has even officially begun. Combining those new shortfalls with the fiscal year 2010 gaps already addressed, and those faced by states that have not yet completed their budgets, the total amount for fiscal year 2010 is at least $166 billion. The states’ fiscal problems are continuing into the next year and likely beyond. At least 29 states have looked ahead and anticipate deficits for fiscal year 2011. These shortfalls total $38 billion — 8 percent of budgets — for the 21 states that have estimated the size of these gaps by comparing expected spending with estimated revenues, and are likely to grow as more states prepare projections and revenues continue to deteriorate. NEW YORK (Fortune) -- Known for his early warnings on Bear Stearns and Lehman Brothers, analyst Martin Weiss of Weiss Research is now sounding the alarm about state of California municipal bonds. In a new report, Weiss has some rather blunt advice for California muni investors: "Sell all California paper now!" His reasoning? California is facing a $24 billion budget gap with no obvious way to close it. The state has appealed to Washington for a federal bailout, but it got a cool response from the Obama Administration. The next step is draconian cuts in state services and payroll, but Weiss says that will only deepen the "depression" in California, where the unemployment rate is 11.5%, by further cutting into tax revenue. Asked to put odds on California defaulting on its $59 billion in outstanding general obligation bonds, Weiss doesn't hedge. "It's unavoidable," he tells Fortune. A California default would be especially devastating for two reasons: Munis have generally been viewed as a safe haven and California is the nation's largest issuer of tax-exempt bonds. According to Morningstar, assets in California muni bond funds now total $46 billion -- with billions more of California bonds held in national muni funds and individual bond portfolios. Last week the Eurosystem performed a €442bn injection of one-year liquidity into the Euro Area banking system. They did this at the official policy rate - the Main refinancing operations (fixed rate) - of 1.00 percent, against the usual collateral accepted for Longer Term Financing Operations, effectively anything euro-denominated, not based on derivatives and rated at least BBB-. It was a fixed-rate tender, that is, the ECB was willing to meet any demand at the 1 percent interest rate, as long as eligible collateral was offered; 1121 banks participated in the operation. You will not be surprised to hear that this was the largest one-day ECB/Eurosystem operation ever. Even more remarkable than its scale are the terms on which the one-year funds were made available. There can be no doubt that this operation represents both a subsidy and a gift from the Eurosystem to the banks that participated in the operation. I hope to clarify the distinction between a subsidy and a gift in what follows. Japan’s consumer prices fell at a record pace in May, adding to the risk that deflation will become entrenched and hamper a rebound from the nation’s worst postwar recession. Prices excluding fresh food slid 1.1 percent from a year earlier after dropping 0.1 percent in the preceding two months, the statistics bureau said today in Tokyo. It was the sharpest decrease since comparable figures were first compiled in 1971. In short; the recession in Japan is beginning to push the economy into the dark hole it has spent nearly two decades trying to escape (and never really managed). The point here is not to harp about headline inflation and whether it will go up or down since we are clearly going to be in situation over the next couple of months in which headline deflation on an annual basis will skew the overall index downwards. But this is hardly the point since, as we can see, the core or core index is declining fast too which tells us that domestic demand pressures in Japan are clearly negative at this point in time and may remain so for as far as the eye of a trained economist should be willing to see. NEW YORK (CNNMoney.com) -- One week and counting. An unprecedented number of states have only days left to pass their fiscal 2010 budgets. At least 19 states are still hammering out their spending plans as the recession wreaks havoc with their finances and sparks fights between governors and lawmakers. If spending plans aren't approved, state workers may not receive their paychecks and some government offices may shut down. Some 46 states end their fiscal years on June 30 and all but one require balanced budgets be adopted. States are struggling to close shortfalls totaling $121 billion for fiscal 2010 as the recession decimates tax revenues. In some states, the leaders aren't even talking. Pennsylvania's governor and Senate Republicans, who have to close a $3.2 billion gap for the current year, are not negotiating on their budgets. "There's been no significant movement on the budget," said Chuck Ardo, press secretary for Gov. Ed Rendell, who is prepared to cancel his African safari in August if the budget isn't set. The governor's $28.4 billion budget seeks to raise the personal income tax rate by half-a-percentage point and draining the commonwealth's $750 million rainy day fund. Senate Republicans' $27.3 billion plan looks to cut spending on areas such as education and community revitalization. California approved its budget in February, but lawmakers and the governor are now locking horns over how to solve a $24 billion shortfall before June 30. The legislature presented a budget proposal last week that includes $11.4 billion in cuts and $2 billion in revenue hikes, but Gov. Arnold Schwarzenegger dismissed it as a piecemeal approach full of gimmicks. If a budget isn't passed in coming days, California will run out of cash and be forced to start issuing IOUs, Controller John Chiang said on Wednesday. The state faced a similar situation in February, but at that time it had the option of withholding $3 billion in state tax refunds. Now, it doesn't have that cushion. Also, the shortfall is now nearly five times as large, forcing the controller to withhold payments to local governments for social services, private contractors, state vendors, as well as income and corporate tax refunds. "Next Wednesday we start a fiscal year with a massively unbalanced spending plan and a cash shortfall not seen since the Great Depression," Chiang said. "The state's $2.8 billion cash shortage in July grows to $6.5 billion in September, and after that we see a double-digit freefall." The report, conducted by the public-policy research arm of the State University of New York, is one of the most up-to-date measures of how deep the recession is digging into Americans' wallets and, consequently, state coffers. Withholdings from the first four months of 2009 were down 6.9% from the same period in 2008, signaling that "many people had a very bad start of the year" with lower salaries and wages, says Don Boyd, a senior fellow at the Rockefeller Institute. The time span notably includes the April 15 deadline for filing taxes, a critical time for states to collect revenues. The sharp decline was a rude awakening for many states, both because income tax is the main source of revenue and because the drop was deeper than expected. It was steepest in Arizona, South Carolina, Michigan, California and Vermont. Only Utah, Alabama and North Dakota posted gains. Personal-income-tax collections were down by $28.8 billion between January and April of 2009, compared to the some period last year, in the 37 states surveyed. Nine states don't collect broad-based personal income taxes, while results for the others weren't available. The plunge in income-tax revenue means some states may have to revise budget agreements for 2009-2010 and may still face gaping holes in 2011, when federal stimulus money runs out. In his daily report yesterday, David Rosenberg had some pertinent things to say about deflation, not the least of which was debunking Melissa Francis' preconception that inflation is equivalent to commodity price increases. The key issue is the differential between absolute and relative price increases: in many ways the current inflation scare is even less moot than the panic in the summer of last year, when it became painfully obvious that neither retailers nor final-state manufacturers have pricing power (think excess capacity: if the manufacturing ISM is any indication, this pricing power is only going to get further obliterated in the coming months, eating away directly at the bottom line, and making the forward EPS ramp up even more of a mirage in the manufacturing sector; also worth pointing out that non-manufacturing ISM actually fell by 2.6% to 44.4%). For a full discussion of this topic, we refer readers to Rosie's June 5 "Breakfast With Dave" piece. A more relevant observation is Rosenberg's presentation of the Household Debt-To-Net Worth ratio (chart below), which is currently at an all time high of 26%. Rosenberg estimates that depending on where this ratio normalizes (either the pre-bubble 20% level, or the long term average of 16%), it would involve a debt elimination of $3-5 trillion. This delta is simply too big to be absorbed by taxpayers: "A goodly chunk of this excess debt — bringing credit into realignment with the permanently new and lower level of household net worth — is going to have to be paid down (or defaulted on). This is the lingering deflation risk that the bond bears have yet to factor in." But what about all the excess cash flooding the system? As has been discussed on numerous occasions, even with the Quantitative Easing cash factored in, we are now in a much worse place from a mortgage interest perspective, and with every incremental increase in far maturity yields, consumers lose additional household value in the form of home equity (if you couldn't sell your half a million dollar house when mortgages were 4.5%, good luck trying to do so at the same price at 5.5%). On the other hand, the stimulus spending focus on infrastructure projects (and an ungodly amount of pork spending) has little hope of creating absolute inflation pressures: rebuilding highways and bridges by retaining minimum wage contractors does nothing to facilitate wage increases, and the unemployment number rising ever higher simply indicates that anyone harboring thought of a raise in this employment-supply glutted environment will be sorely disappointed for a long, long time. As for the money multiplier effect - just take a look at the latest excess deposit reserve number. That's right: $838 billion in cash which nobody has any interest borrowing. In fact, the latest consumer credit number jives perfectly with a reversion to the mean as expected by the chart above. The bottom line - the U.S. consumer does not buy Bernanke's belief (nor Wall Street's consensus of almost 50% who say that the Fed Funds rate will be higher than 0% in three months). One last point worth noting out is the amusing lose-lose situation (as Rosenberg presents it) which the Fed has painted itself with regard to Treasuries: "if the Fed doesn’t step in and buy more government bonds, investors are going to conclude that there is not enough demand to absorb all of the new supply coming on stream. Yet, if the Fed were indeed open to the idea of expanding its bloated balance sheet further, then the ‘monetization of debt’ would cause the inflation-phobes to panic and sell their long-duration paper." So yes, all in all an admirable effort by the fed to give the impression that debt is deflating, happily gobbled up by the equity market. Of course it all occurred on the back of a plummeting dollar. It is inevitable that this trend will reverse promptly once the U.S. finds itself in an increasingly more problematic trade vacuum, as Japan and Europe realize they actually need to export products. In the prisoner's dilemma game of monetizing debt, Bernanke and Obama have defected against every single player, without repercussions yet, and have already lost any potential benefit from this action. It is our belief, that the next round will see defections by all those who have realized the Fed is now acting purely for its own, unitary interest. Politically destabilizing events like the parliamentary crisis in the UK, the IMF bailout of Eastern Europe, and others will only accelerate a wave of monetary backlash against the US. Then at some point the coincident dollar revaluation combined with the increasingly more trigger-happy bond vigilantes, and the consistently deleveraging consumer will expose the debt deflation for the mirage it was, and the equity market which has been in its own little world for way too long will finally get reacquainted with gravity. As economic conditions deteriorate and unemployment continues to soar, one in nine Americans are now on food stamps. Moreover, a staggering one of every six dollars of Americans' income is now coming in the form of a federal or state check or voucher. According to the USDA One in nine Americans on food stamps. One in nine Americans are using federal food stamps to help buy groceries as the country's deep recession forced another 591,000 people onto the federal anti-hunger program at latest count. Enrollment jumped 2 percent to 33.2 million people in March, the fourth consecutive month that rolls hit a record, said the Agriculture Department. The average monthly benefit was $113.87 per person. "It's tough out there for struggling families and will be for many months to come," Jim Weill, president of the Food Research and Action Center, said. In 20 states, as many as one in eight are on the food stamp program, according to the Food Research Center. In all, government spending on benefits will top $2 trillion in 2009 — an average of $17,000 provided to each U.S. household, federal data show. Benefits rose at a 19% annual rate in the first quarter compared to the last three months of 2008. "The increase in social spending is still relatively modest given the severity of the downturn," says economist Dean Baker of the liberal Center for Economic and Policy Research. "We're not France." Adam Lerrick, economist at the conservative American Enterprise Institute, says the benefits' explosion will eventually lead to an economic crisis. "We've seen this movie before in many countries. It always has the same ending," he says. Nevada, Michigan and California had the biggest per-capita increase in bankruptcy filings in May, according to AACER. California is paying out so much for jobless benefits and collecting so little in payroll taxes that its unemployment insurance fund could be $17.8 billion in debt by the end of 2010, according to a new report from the state Employment Development Department. This latest fiscal crisis won't immediately affect the 1.1 million Californians now collecting benefits because the state is using an interest-free federal loan to cover their checks. But the state is supposed to repay that loan and restore its unemployment fund to solvency by 2011 - and right now, policymakers aren't sure exactly how to do that, or at what cost. "The deficit that California looks like it is facing is staggering," said Bud Bridger, fiscal officer for the unemployment insurance program. To rebalance the system and pay back the federal loan, lawmakers must raise payroll taxes on employers, reduce benefits for recipients, or both. In 2009 and 2010, the state expects to pay out $29 billion in benefits. It will collect just $11 billion. Collectively this is a stunning series of problems, both nationally and locally. California is $17.8 billion in the hole (and counting) on unemployment insurance but the legislature is not even looking at the situation because of more pressing problems and because the state is using an interest-free federal loan to cover benefits. Excuse me but is this $17.8 billion deficit in addition to the $24 billion budget deficit? How the Hell is California going to pay that back and fix a $24 billion budget deficit that without a doubt will cause a massive increase in unemployment? Has anyone factored that in? How can loans of $17.8 billion not be considered as part of the deficit that needs to be fixed? What about California pension promises that cannot possibly be met? One final question: Are we France or does it just look like we're headed that way? Every first Friday of the month we look at the headline numbers from the Bureau of Labor Statistics: so many jobs were added or lost last month; thus, we deduce the economy to be growing or declining. But this is less than half of the story; we rarely- if ever- discuss what kind of jobs are involved. I believe this to be superficial analysis and highly misleading. For example: a skilled auto worker making $30/hr is fired and gets a job tending bar at $7/hr plus tips. Are these two jobs equivalent? Of course not. About two years ago ago I started looking at the wholesale disappearance of goods-producing jobs in the US versus the creation of lower-to-middle tier service sector jobs (leisure and hospitality, retail, healthcare and education). I have now updated the chart presented in the original post; I think it speaks for itself (see below). WASHINGTON — The Federal Deposit Insurance Corporation indefinitely postponed a central element of the Obama administration’s bank rescue plan on Wednesday, acknowledging that it could not persuade enough banks to sell off their bad assets. In a move that confirmed the suspicions of many analysts, the agency called off plans to start a $1 billion pilot program this month that was intended to help banks clean up their balance sheets and eventually sell off hundreds of billions of dollars worth of troubled mortgages and other loans. Many banks have refused to sell their loans, in part because doing so would force them to mark down the value of those loans and book big losses. Even though the government was prepared to prop up prices by offering cheap financing to investors, the prices that banks were demanding have remained far higher than the prices that investors were willing to pay. In a statement, the F.D.I.C. acknowledged that it had not been able to get banks interested in its so-called Legacy Loans Program. Scheduled to start later this month, the pilot program was aimed at selling off $1 billion in troubled home mortgages. F.D.I.C. officials portrayed the change as a sign that banks were returning to health on their own. Consumer and commercial bankruptcy filings are on pace to reach a stunning 1.5 million this year, according to a report from Automated Access to Court Electronic Records. In May, the number of bankruptcy filings reached 6,020 a day, up from 5,854 in April, AACER says. More debt-laden consumers are turning to consumer credit counseling services for assistance. But credit counselors say that it's harder than ever to help them. "People are coming to us in much worse shape than they used to be," says David Jones, president of the non-profit Association of Independent Consumer Credit Counseling Agencies. "We used to be able to help 20% to 25% of people who came to us, and now we can only help 7% to 8%." Even the commercial bankruptcy rate is soaring, driven by shrinking sales and tight credit markets. Last month, commercial filings hit 376 a day, up from 255 in May 2008. Hartmarx, which manufactures and markets apparel, and Silicon Graphics, a manufacturer of computer workstations and storage products, were among the filers. The wave of corporate bankruptcies will cause a secondary wave in consumer filings, says John Pottow, University of Michigan bankruptcy law professor. Bankruptcy filings are not climbing at the same rate in every state. Nevada, Michigan and California had the biggest per-capita increase in bankruptcy filings in May, according to AACER. "Nevada doesn't surprise me," Pottow says. "It is ground zero of the housing crisis." And California also has suffered from the boom and bust of the housing market. By contrast, Michigan is dealing with the collapse of the auto industry. The recent bankruptcy filings of Chrysler and General Motors, along with plant closings and job losses, will spark even more consumer bankruptcy filings, Pottow says. The study found that medical bills, plus related problems such as lost wages for the ill and their caregivers, contributed to 62% of all bankruptcies filed in 2007. On the campaign trail last year and in the White House this year, Obama had cited an earlier study by the same authors showing that such expenses played a part in 55% of bankruptcies in 2001. Medical insurance isn't much help, either. About 78% of bankruptcy filers burdened by healthcare expenses were insured, according to the survey, to be published in the August issue of the American Journal of Medicine. "Health insurance is not a guarantee that illness won't bankrupt you," said Steffie Woolhandler, one of the authors, a practicing physician and an associate medical professor at Harvard. "Lots of health insurance comes with big co-payments, deductibles and uncovered services," she said. "So you can be insured and still end up with big bills. At the same time, even if you have good insurance through your employer, you can lose it if you get sick and can't work." Most people who filed medical-related bankruptcies "were solidly middle class before financial disaster hit," the study says. Two-thirds were homeowners, and most had gone to college. Half a million Americans lost their jobs in April, meaning there are now officially 14 million unemployed workers, the highest percentage in 25 years, and the strain on the unemployment system is beginning to show. A compromise dating back to 1935 means each state has its own unemployment insurance system, with wide latitude to set taxes and benefit levels. As state systems buckle under the weight of skyrocketing unemployment, the fault lines of the current structure have been brought into stark relief. States have been left on their own to financially founder or prosper, and benefits vary nearly as much as the health of state systems. Fourteen states have simply run out of money to pay benefits and been forced to borrow from Washington a total of more than $8 billion. That number is almost certain to grow as more states reach the brink. If they are not able to pay that amount back before 2011, which most will not be able to do, they face paying hundreds of millions of dollars in interest. Meanwhile, many workers are struggling to get by on what the system pays them. Where you live can make all the difference -- workers in the most generous states get twice the average benefits of workers in the stingiest ones. The percentage of unemployed workers who even receive benefits varies greatly by state. Unemployment insurance is also intended to be automatic stimulus during a recession, keeping people spending and businesses open. "The idea is you accumulate reserves and then you can support spending when the economy goes south," said Gary Burtless , an economist at the Brookings Institution. But many states have failed to do that, and they're now paying the price. Indiana, which ran out of reserves last year, just raised its unemployment taxes by 35 percent, right in the middle of a deep recession when businesses can least afford it. Other states did not plan as well. Many have been maintaining close to zero reserves  for years, well before the economy headed south. California, for example, got into trouble by raising benefits without increasing taxes. Other states, like Michigan, lowered taxes to unsustainable levels and watched their reserves dwindle. Now, these states will be forced to raise taxes or cut benefits in the middle of a recession -- just when those changes will do the most economic damage. Separate systems also mean state lawmakers must worry about the possibility of driving businesses out of their state -- into other states that may be undercutting them with unsustainable tax rates, said Doug Holmes of UWC — Strategic Services on Unemployment and Workers' Compensation, who has advised many states on unemployment insurance from a business perspective. "It is a competitive environment, let's face it," Holmes said. "Each state doesn't operate on an island." The amount of benefits disbursed to unemployed workers to boost their spending also varies widely. In Massachusetts, the average unemployed worker gets $411 per week. In Mississippi, where Gov. Haley Barbour recently called unemployment taxes "a tax on job creation," it's $197. Of course, a buck goes further in Mississippi -- but not that much further. On average, workers who rely on unemployment insurance get about half as much as they earned while they were working. In some states it is much less, and it may get lower as policymakers struggle to keep their unemployment insurance systems afloat. There are also wide variations in the percentage of unemployed workers who collect benefits. Nationwide, only about 30 percent of workers who lose their job ever see an unemployment check, but in some states it is as high as 80 percent. Some of the variation is due to differences in who is allowed to collect benefits, some is because many workers -- particularly in states where unemployment insurance is considered a welfare program -- never apply. Why did Goldman Sachs, Citigroup and Morgan Stanley steer millions to a company Larry Summers directed while he administered "stress tests" on them? Last month, a little-known company where Summers served on the board of directors received a $42 million investment from a group of investors, including three banks that Summers, Obama’s effective “economy czar,” has been doling out billions in bailout money to: Goldman Sachs, Citigroup, and Morgan Stanley. The banks invested into the small startup company, Revolution Money, right at the time when Summers was administering the “stress test” to these same banks. What can't be paid back will be defaulted on. Consumers with no job have no chance of paying back those debts. Many others who could, won't (because it is in their best interest to walk away). The Alt-A and Option ARM defaults are going to be massive. Think this leads to inflation? Think again. There have been job losses every month since December 2007. Moreover, there is no letup in sight as Continuing Claims Approach 6.8 Million, 17th Consecutive New Record. The dip in initial claims from the March peak of roughly 650,000 is not accelerating very fast, if indeed at all. Those looking for a recovery in jobs soon are going to be disappointed. Economists expect to see unemployment by 10% at the end of the year. I expect to see it at 9.8%+- by August and approaching 11% by the end of the year. 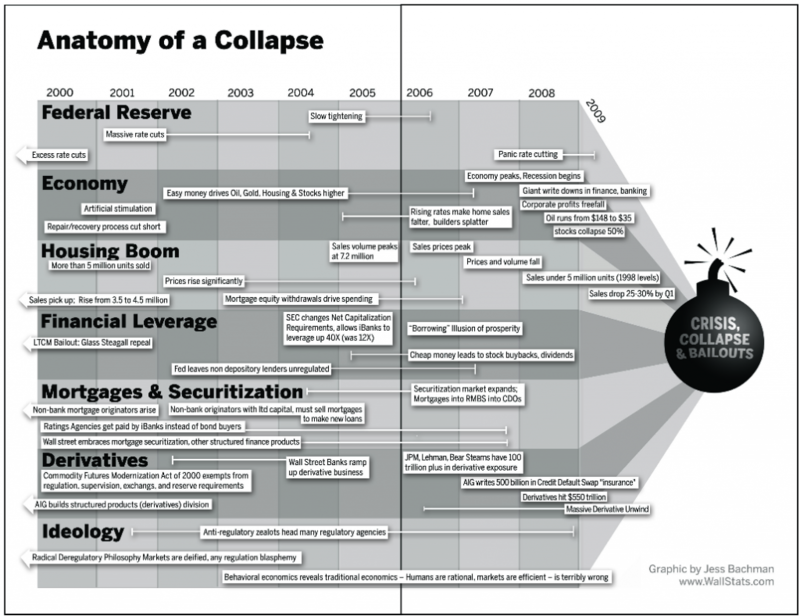 Bear in mind the "stress-free tests" conducted by the Fed had an adverse scenario of 10.3% at the end of 2010. The Decline from Peak Employment Now Exceeds the Past Five Recessions. Total Losses Are Now Estimated at $2.1-$3.8 Trillion – And Less Than Half of This Has Been Realized To Date. Cash strapped cities, states, and municipalities are increasingly looking to raise revenue by issuing tickets instead of cutting expenses. I have had 3 different people tell me they got tickets from the CHP or San Francisco Police over the weekend. One ticket was written for having tinted windows. The officer in SF wasn’t even interested in the fact that the windows were tinted by the Audi Company and by regulation. On one section of 101, where it’s not “really a highway” the CHP were lying in wait behind bushes-in a multicar queue for a rapid rollover of wallets. The motherload, a carpool violation, was enforced en masse on the Bay Bridge on Friday prior to the holiday. That’s 300 bucks a pop and I saw about 6 tickets being written where normally I see about 2 a week being enforced. Public enforcement of law is fine, but it’s pretty obvious that the authorities have more in mind this year. Click it or TICKET. As if it’s really a big problem these days! The February issue of Car and Driver includes a story describing how many jurisdictions are giving more traffic tickets as a revenue booster during tough financial times. In Texas, to my mind, we've already taken this strategy about as far as it can go, to the point that, right now, more than 10% of Texas adults have outstanding arrest warrants - mostly for traffic tickets. Dallas County represents perhaps the most extreme example of this trend in Texas. According to the Dallas Morning News ("Dallas county to vote on withholding vehicle registrations for those who owe fines," Feb. 9), "Unlike most counties, Dallas County gets slightly more than half of its annual revenue from fines and fees. Other counties rely more heavily on property-tax revenue." Now Dallas plans to step up the pressure on even more on folks who can't or don't pay traffic fines, denying vehicle registration to drivers with outstanding traffic tickets. Again, we're talking about more than 10% of the adult population! In addition, traffic "eyes" are sprouting up everywhere near where I live. Is this making anyone safer? I doubt it. Then again it's not supposed to. Moreover, it's so out of hand that 10% of Texans in some major cities have arrest warrants. How's that for complete insanity? Homeowners from New York to Florida and in the Gulf Coast region are again seeing premiums rise and coverage change. And more are being dropped completely by their carriers as insurers try to limit their exposure in high-risk areas. "They just don't like being in the business ... too much risk," said Scott Hall of Market Street Advisers, a financial advisory firm in Wilmington, N.C. Homeowners' insurance premiums are up about 3 percent nationwide and probably more in some coastal areas where the potential for damage is greater, according to the Insurance Information Institute, a New York-based industry group. The hurricane season starts Monday and runs until Nov. 30. Several factors are affecting premiums and coverage, including the $26 billion insurers paid out on catastrophic losses last year and the impact of financial market turmoil on the companies' earnings. Changes in state regulations are also driving some premiums higher. Late last year, Allstate Corp. and State Farm Insurance Cos., two of the nation's top home and auto insurers, raised premiums in states including Texas, saying the increase was needed to offset a rising number of claims. Hurricanes Gustav and Ike hit the U.S. in September. Northbrook, Ill.-based Allstate also implemented policy changes that raised deductibles and stopped offering coverage in high-risk coastal areas including downstate New York. Meanwhile, State Farm Florida, a subsidiary of the Bloomington, Ill.-based insurer, is trying to pull out of the Florida market after the state denied the company's request for a 47 percent rate hike. Company officials have said they need the increase to remain financially viable. Discussions with regulators are continuing. Shawna Ackerman, who co-chairs the American Academy of Actuaries' property and casualty extreme events committee, said she has not heard of any mass non-renewals or existing policy changes that are in the works for 2009. But insurers are continuing a process that began after they paid out $23.7 billion in claims -- a number adjusted for inflation as of 2008 -- on Hurricane Andrew in 1992, trying to limit their exposure, or vulnerability to losses, in coastal areas. Hurricanes Ivan in 2004 and Katrina in 2005 forced several to pull back further, with many companies re-evaluating policy coverages and raising rates. Ivan caused more than $8.1 billion in losses after adjusting for inflation, while Katrina was the most costly, with losses now calculated at $45.2 billion, according to Insurance Information Institute data. "Over the last five years, where we've seen record catastrophe losses in coastal areas -- Florida, Mississippi, Louisiana and Texas -- the increases in (premiums in) those areas have outstripped what we have seen nationally," said Bob Hartwig, the Insurance Information Institute's president. Insurers will raise premiums wherever state regulators allow them to, Hartwig said. "In areas where they are not given that opportunity, insurers are going to scale back their exposure." In 2007, Florida ranked as the state with the greatest hurricane exposure, facing a potential $2.46 trillion in losses, according catastrophe risk-modeling firm AIR Worldwide Corp. A close second, New York had $2.38 trillion in exposure; and third was Texas with $895.1 billion of exposure. WASHINGTON -- After months of speculation, the time has come for life insurance companies to tap the government's bailout fund. According to Treasury Department spokesman Andrew Williams, at least six insurers on Thursday were given preliminary approval to receive funds from the Treasury's Troubled Asset Relief Program: Prudential Financial ( PRU - news - people ), Lincoln National ( LNC - news - people ), Allstate ( ALL - news - people ), Principal Financial ( PFG - news - people ), Hartford Financial ( HIG - news - people ) and Ameriprise Financial ( AMP - news - people ). The companies had all applied for bank holding status by a deadline of Nov. 14 of last year, making them eligible to receive funding under a facet of the TARP that so far has allocated $218 billion to 532 banks. Williams said via e-mail that the companies, like other firms that receive TARP money, "will be reviewed and funded as appropriate on a rolling basis." Only about $110 billion of the original $700 billion TARP remains on hand. Like banks, insurance companies have been hamstrung by losses on their investments, and they need to meet minimum capital standards to be able to make payouts on their policies. Although several firms had applied for aid, only one major insurer, American International Group ( AIG - news - people ), had been approved for TARP funding until now. Since last September, AIG has received some $180 billion in taxpayer funds because the government feared for the stability of the economy should the firm fail. WASHINGTON, D.C. — Freight traffic on U.S. railroads during the week ended May 23 remained down in comparison with last year, although it did show an increase from the previous week this year, the Association of American Railroads reported today. Property prices are down 32% So let’s take a closer look at US residential property prices which have been falling steadily for almost two years now. One of the better measures of that market is the Case-Shiller index. The index peaked in July 2006 and has since dropped by 32%. Now, in order to revert to the mean, US property prices must fall by about 40% or so in total. Therefore, with a bit of luck, those long suffering US home owners are about 75% of the way through the bear market. But that is not the point I want to make. In December 2006, only a few months after the peak of the housing bull market, the total value of US residential property stood at $21.9 trillion. Prices have dropped by 31% since the end of 2006, so the estimated value today is about $15 trillion; however, the mortgage debt remains more or less unchanged and stands at $10.6 trillion. In other words, whereas debt-to-equity in the US housing market was 48% as recently as in December 2006, it is now 70% and will rise to 80% once house prices have mean-reverted. Almost one-third of all US households have no mortgage. If you adjust for that, the 70-80% debt-to-equity ratio suddenly becomes a major challenge because it means that the two-thirds who do have a mortgage already face a debt-to-equity ratio in excess of 100%. Even worse, once the mean reversion has run its course, two-thirds of US households will be facing a debt-to-equity ratio of 120-125% on average. US consumers are broke That is a shocking number and it blows a huge hole through the heart of the green shoots campaign so valiantly promoted by most of the mainstream media in recent weeks. The poorest two-thirds of US households are effectively broke, whether they realise it or not. Obviously, households have assets and liabilities other than property and mortgages. Deutsche Bank has created a measure of liquid assets to liabilities which is illustrated in chart 2 below. As you can see, there has been significant damage done to households’ balance sheets in recent years. The first wave (2000-03) was mostly a function of the collapse of the dot com bubble. The second wave (2007- ) has come about as a result of the more recent collapse in property and share prices. It is probably fair to say that US households are more financially stressed than at any time since the Great Depression. As DB points out in its report, households’ ability to spend is a function of three factors - cash flow (which again is driven mainly by income, mortgage rates and tax), credit (bank lending) and homeowner equity (property prices). Now, with negative equity against their main asset, with even more pressure on income as a result of the recession and with virtually no savings to cushion the pain, the majority of US households have no choice but to cut back drastically on their consumption. And with the US consumer being forced to pull back, the global recovery story turns very pale indeed. Over the years I have learned never to underestimate the determination of the US consumer. He has always been prepared to spend his last dollar. Even when the tank was empty, he re-mortgaged his house so that the spending spree could continue a little longer. 70% of the US economy is accounted for by the consumer. That is more than 10% higher than the EU average (see table 1). Within the EU, only the UK comes close. But his options are running out. There can be no doubt that the party is well and truly over. We need the US consumer! There is plenty of schadenfreude to detect here in Europe. Yet most of those people who argue that the American consumer has dug his own grave by acting so “irresponsibly” fail to understand that it is precisely the over-consumption in America which has driven the global economy to the lofty levels we have all come to like and enjoy. Without Americans being prepared to spend their last dime, there would have been no BRIC fairy tale and there would have been no German export boom, masking the fact that the domestic German economy has been on life support for a number of years now. I could hardly believe my eyes and ears when, during the recent G20 summit in London, she declared that the German growth model would continue to be based on exports. To whom may I ask? U.S. railroads originated 259,265 cars during the week, down 21.5 percent from the comparison week in 2008, but up 4.9 percent from the previous week this year. In comparison with last year, loadings were down 16.4 percent in the West and 28.0 percent in the East. All 19 carload commodity groups were down from last year, with declines ranging from 4.8 percent for farm products other than grain to 59.7 percent for metallic ores. Intermodal volume of 188,885 trailers or containers was off 19.1 percent from last year, with container volume down 14.2 percent and trailer traffic off 37.2 percent. Intermodal volume was up 0.2 percent from the previous week this year. Total volume was estimated at 27.4 billion ton-miles, off 20.3 percent from 2008, but up 4.6 percent from the previous week this year. Wow, this sounds pretty good! WASHINGTON -- U.S. banks reported a first-quarter profit of $7.6 billion, buoyed by revenue at a few larger companies, but overall the credit picture remained grim as the number of banks in trouble continued to rise and borrowers increasingly fell behind on their loans. Let's think. During that quarter AIG passed through some $100 billion plus from the taxpayer to the largest of these very same banks. So the banks "made" $7.6 billion, but they had an "unearned gain" of over $100 billion. Let's call it an even $100 billion as some of it didn't stay here in the United States. Still, the latest results were an improvement from the industry's net loss of $36.9 billion in last year's fourth quarter. They were? I guess if you can count robbery as an "improvement", ok. But let's look at this from a different angle - back out that "unearned" and illicit gain from the passthrough and they would have lost $92.4 billion dollars, or well more than twice last year's fourth quarter. Heh, if I can steal making my numbers is easy! All you have to do is leave the bank vault open and promise me that there are no guards, no cameras and no guns! I will then march in and steal whatever I want, and of course will turn in respectable quarterly results. Despite those actions, banks were increasingly unable to build their reserves fast enough to keep up with noncurrent loans. The ratio of reserves to noncurrent loans fell to 66.5% in the first quarter from 74.8% in the fourth quarter. It was the lowest level in 17 years. To put this in a bit more simple form, this means that while the banks are claiming to be increasing loss provisions, loans are going bad faster than their provisioning is increasing - which means they're reporting "profits" that are false, as provisions for bad loans hit earnings. So we can take some more off those "reported earnings", as much as another $6-10 billion dollars. Do those reported numbers still look ok? What's worse is that the banks are charging off (that is, disposing as worthless) a huge amount and yet even that is not slowing down the bad loan count - they're going delinquent faster than the banks are charging them off. WASHINGTON -- A government program designed to rid banks of bad loans, part of a broader effort once viewed as central to tackling the financial crisis, is stalling and may soon be put on hold, according to people familiar with the matter. May 26 (Bloomberg) -- The highest-graded bonds backed by commercial mortgages may be cut by Standard & Poor’s, potentially rendering the securities ineligible for a $1 trillion U.S. program to jumpstart lending. As much as 90 percent of so-called super senior commercial- mortgage backed bonds sold in 2007 may be affected as the ratings firm changes how it assesses the debt, New York-based S&P said today in a report. About 25 percent of the bonds sold in 2005, and 60 percent of those sold in 2006 may be cut. This change will drive a stake through the heart of that program - expect to see those spreads start to blow out again, and soon, as commercial real estate is in much more trouble than is being discussed openly. Simply put there is far too much supply and far too many retailers that are or will go under to support it. There's no realistic possibility of fixing this problem and as a consequence the expectation has to be that we will see an all-on collapse at some point in the not-so-distant future in this marketplace as rent collections and therefore valuations collapse. Now add a dose of panic in the Treasury market, and oh boy, things could get interesting fast, no? Buckle up folks - this ride is likely to be a bit rough. ARLINGTON, Va., May 26 /PRNewswire-USNewswire/ -- The American Trucking Associations' advance seasonally adjusted (SA) For-Hire Truck Tonnage Index fell 2.2 percent in April, after plunging 4.5 percent in March. April marked the second sequential decrease. In April, the SA tonnage index equaled just 99.2 (2000 = 100), which is its lowest level since November 2001. The not seasonally adjusted (NSA) index, which represents the change in tonnage actually hauled by the fleets before any seasonal adjustment, was down 2.9 percent from March. In April, the NSA index equaled 101.6. Compared with April 2008, tonnage contracted 13.2 percent, which was the worst year-over-year decrease of the current cycle and the largest drop in thirteen years. In March 2009, tonnage dropped 12.2 percent from a year earlier. ATA Chief Economist Bob Costello said truck tonnage is getting hit from both the recession and the massive inventory correction that the supply chain is currently undergoing. "While most key economic indictors are decreasing at a slower rate, the year-over-year contractions in truck tonnage accelerated because businesses are right-sizing their inventories, which means fewer truck shipments," Costello said. "The absolute dollar value of inventories has fallen, but sales have decreased as much or more, which means that inventories are still too high for the current level of sales. Until this correction is complete, freight will be tough for motor carriers." Costello added that truck freight has yet to hit bottom and it could be a few more months before this occurs. May 28 (Bloomberg) -- Mortgage delinquencies and foreclosures rose to records in the first quarter and home-loan rates jumped to the highest since March this week as the government’s effort to fix the housing slump lost momentum. The U.S. delinquency rate jumped to a seasonally adjusted 9.12 percent from 7.88 percent, the biggest-ever increase, and the share of loans entering foreclosure rose to 1.37 percent, the Mortgage Bankers Association said today. Both figures are the highest in records going back to 1972. About half of the new foreclosures were in four states: California, Florida, Arizona and Nevada, according to the report. Measuring both old and new defaults, 11 percent of all mortgages in Florida were in foreclosure at the end of the first quarter, the highest in the U.S. In Nevada, it was 7.8 percent, in Arizona, it was 5.6 percent, and in California, it was 5.2 percent. New Jersey’s foreclosure inventory was 4.3 percent, New York was 3 percent, and Massachusetts was 2.8 percent. The average rate for a 30-year loan jumped from 4.82 percent a week earlier, Freddie Mac, the McLean, Virginia-based mortgage buyer, said today in a statement. The rate was 5.1 percent at the beginning of the year. New home sales fell 34 percent in April from the year earlier period, the Commerce Department said today. The unemployment rate increased to 8.1 percent in the first quarter, the highest since the end of 1983, according to the Bureau of Labor Statistics. The inventory of new foreclosures and those already in the process of being foreclosed upon jumped to 3.85 percent, the MBA said. Half the loans now in foreclosure, adding the new and existing defaults, are held by prime borrowers, according to the trade group’s report. I believe the risk posed by this debt is systemic and could do more damage to the economy than the recent financial crisis. To understand the size of the risk, take a look at the numbers that Standard and Poor’s considers. The deficit in 2019 is expected by the CBO to be $1,200bn (€859bn, £754bn). Income tax revenues are expected to be about $2,000bn that year, so a permanent 60 per cent across-the-board tax increase would be required to balance the budget. May 27 2009 "The Telegraph" -- Richard Fisher, president of the Dallas Federal Reserve Bank, said: "Senior officials of the Chinese government grilled me about whether or not we are going to monetise the actions of our legislature." "I must have been asked about that a hundred times in China. I was asked at every single meeting about our purchases of Treasuries. That seemed to be the principal preoccupation of those that were invested with their surpluses mostly in the United States," he told the Wall Street Journal. His recent trip to the Far East appears to have been a stark reminder that Asia's "Confucian" culture of right action does not look kindly on the insouciant policy of printing money by Anglo-Saxons. Mr Fisher, the Fed's leading hawk, was a fierce opponent of the original decision to buy Treasury debt, fearing that it would lead to a blurring of the line between fiscal and monetary policy – and could all too easily degenerate into Argentine-style financing of uncontrolled spending. However, he agreed that the Fed was forced to take emergency action after the financial system "literally fell apart". Nor, he added was there much risk of inflation taking off yet. The Dallas Fed uses a "trim mean" method based on 180 prices that excludes extreme moves and is widely admired for accuracy. "You've got some mild deflation here," he said. The Oxford-educated Mr Fisher, an outspoken free-marketer and believer in the Schumpeterian process of "creative destruction", has been running a fervent campaign to alert Americans to the "very big hole" in unfunded pension and health-care liabilities built up by a careless political class over the years. "We at the Dallas Fed believe the total is over $99 trillion," he said in February. "This situation is of your own creation. When you berate your representatives or senators or presidents for the mess we are in, you are really berating yourself. You elect them," he said. Federal tax revenue plunged $138 billion, or 34%, in April vs. a year ago — the biggest April drop since 1981, a study released Tuesday by the American Institute for Economic Research says. Income tax revenue dropped 44% from a year ago. "These are staggering numbers," Lynch says. Big revenue losses mean that the U.S. budget deficit may be larger than predicted this year and in future years. Couple that with rising social costs....and it gets messy quick as California...and for that matter the rest of the nation...is finding out. Home prices in Minneapolis continue to tumble at an astonishing rate, down more than 6 percent in March with a year-over-year drop of 23.3 percent, sixth worst of the 20 cities. Declines in residential real estate continued at a steady pace into March. All 20 metro areas are still showing negative annual rates of change in average home prices with nine of the metro areas having record annual declines. Seventeen metro areas recorded a monthly decline in March, with Minneapolis, Detroit and New York posting record monthly declines. It has only been three months, but prices are tracking close to the 'More Adverse' scenario so far. In Phoenix, house prices have declined 53% from the peak. At the other end of the spectrum, prices in Charlotte and Dallas are off about 11% to 12% from the peak. Prices have declined by double digits everywhere. Prices fell sharply in most Case-Shiller cities in March, with Minneapolis off 6.1% for the month alone. Denver, Dallas, and Charlotte showed small price gains. The recent rally in crude has been separately characterised as both an instance of irrational exuberance and as a legitimate ‘green shoot’ of economic recovery. Merrill Lynch, however, firmly sees it as a risk to global recovery, in a research note out Tuesday morning. Commodity prices have rallied tremendously from their February lows in recent weeks … leading some to argue that rising commodity prices are a sign of the incipient economic recovery. More broadly, risky assets including equities, commodities and high yield bonds have rallied … while the USD has continued to depreciate against both G10 and EM currencies. These sharp, almost violent, market moves have caught many investors by surprise, and there is now a widely held belief that rising commodity prices are a “green shoot” of recovery in the global economy. However, a very fast increase in oil prices in the coming months could soon put the embryonic economic recovery at risk. In turn, an excessive rally in oil could put an end to the raging bull market in risky assets. Is there a near-term inflexion point in oil prices? Our economists believe that a jump in oil prices to the $70-80/bbl range could start to pose some meaningful risks to economic growth in OECD countries. Meanwhile, our economists see the risks to growth in the $90-100/bbl range for EMs. A struggling economy and a forecast of income tax revenues that was far off the mark has Cincinnati City Council staring at a $40 million budget deficit through 2010 - sparking talk of layoffs and cuts in service in the year to come. Council's finance committee received a report from the city's finance department Monday saying the city was already $7.7 million behind its revenue forecast by the end of April. And, if the trend continues, the city could face a deficit of about $40 million through next year. "Hell would have to freeze over for us to get out of this,'' said Council member Leslie Ghiz. "There will be layoffs. There will be cuts. And it will be painful." For the short term, City Manager Milton Dohoney has called for a five percent cut in 2009 spending from all city departments; and ordered department heads to submit plans to him by the end of the week on how they will do that. But Tuesday, several council members said that a five percent budget cut is probably not enough, while others said that consideration ought to be given to sparing essential city services like police and fire from the budget cuts. At a time when most government bodies were bracing for revenue shortfalls in a troubled economy, the city administration predicted that, in 2009, the city would see a three percent increase in income tax collections. Income taxes are by far the biggest source of the city's revenue, making up about 65 percent of the city's $375 million general fund budget. Instead, through April, the city's income tax collections were $6.1 million below forecast, according to the report Dohoney and city finance director Joe Gray delivered to the finance committee Monday. Maybe that's the real solution to the fiscal imbalances here in the Golden State, imbalances that just rose from about $15 billion to about $21 billion (down from $42 billion earlier in the year) after voters nixed five of six budget measures yesterday. The only initiative that passed - by a whopping 74 percent to 26 percent margin - was aimed at penalizing lawmakers during years when the state runs a deficit by prohibiting pay raises for said lawmakers. There's a good deal of irony in the fact that this measure was on the ballot at all - as if elected officials felt they had to show some level of responsibility for having created such a mess, along with, perhaps, a little humility. There's even more irony in the election results that, despite a ten-to-one advantage in campaign spending, saw all measures that would either raise taxes or use sleight of hand to make ends meet fail so miserably by comparison - it wasn't even close. You can almost imagine the discussion when adding Proposition 1F to the list - about lawmakers being held accountable for their actions and being more responsible. Little was it known at the time what an easy platform was being provided for voters to voice their displeasure with the crew in Sacramento. Granted, the system as currently constructed is unworkable and it needs to be fixed - requiring a two-thirds vote for the passage of a budget when combined with the ballot initiative process sets anyone up for failure. But, the state just spends too damn much money. The only way the current level of spending can be made to function within the current system is if you have massive asset bubbles that generate massive tax revenue bubbles that dupe elected officials into thinking a "new normal" has been achieved. With no hope of either a technology bubble or a housing bubble reinflating anytime soon, we're clearly headed back to the "old normal". So, elected officials now huddle in the state capitol, pondering thousands of layoffs for the state's 235,000 workers which, clearly, is way too many to begin with. The education and healthcare budgets look ready to be slashed by billions of dollars, local government coffers may be raided, and tens of thousands of inmates may be booted from state prisons. This should be interesting to watch - I'm glad we we'll be able to watch it from a distance. May 20 (Bloomberg) -- Japan’s economy shrank at a record 15.2 percent annual pace last quarter as exports collapsed and consumers and businesses cut spending. The contraction followed a revised fourth-quarter drop of 14.4 percent, the Cabinet Office said today in Tokyo. Gross domestic product fell 3.5 percent in the year ended March 31, the most since records began in 1955, confirming that the recession is Japan’s worst in the postwar era. Exports plunged an unprecedented 26 percent last quarter, forcing companies from Toyota Motor Corp. to Hitachi Ltd. to cut production, workers and wages. Stocks have gained 32 percent since reaching 26-year low in March on speculation worldwide interest-rate reductions and spending by governments will halt the slide in the world’s second-largest economy. The Fed’s balance sheet expanded in the latest week to $2.20 trillion from $2.08 trillion. Direct lending to banks was higher, and recent demand for the TALF began to show up. This video is a must watch for anyone who wants to understand just how "effective" the Fed is at safeguarding taxpayer money. Apparently nobody at the Federal Reserve has any clue where the trillions of dollars that have come from the Fed's expanded balance sheet have gone. Additionally, nobody there seems to have any idea what the losses on the Fed's $2 trillion portfolio really are. As for the pittance of $9 trillion in Fed off-balance sheet transactions over the past 8 months, well, yeah, that's also somewhere out there... Just don't ask the Federal Reserve where. Rep. Alan Grayson summarizes it best "I am shocked to find out that nobody at the Federal Reserve is keeping track of anything." (P.S. Zero Hedge uses the term "anyone" generically, with the presumption that the Fed's Inspector General should traditionally receive most memos on memorandum items that deal with a dollar sign and +/- 12 zeros after it). Rep. Alan Grayson asks Inspector General Coleman of the Federal Reserve some very basic questions of about various Fed programs and activities and gets nowhere. And the worse is that the IG isn't stonewalling, but instead is clearly completely clueless. Watching the video, you get the impression that Coleman can't name a program beyond the TALF. May 19 (Bloomberg) -- Goldman Sachs Group Inc., JPMorgan Chase & Co. and Morgan Stanley applied to refund a combined $45 billion of government funds, people familiar with the matter said, a step that would mark the biggest reimbursement to taxpayers since the program began in October. The three New York-based banks need approval from the Federal Reserve, their primary supervisor, to return the money, according to the people, who requested anonymity because the application process isn’t public. Spokesmen for the three banks declined to comment, as did Calvin Mitchell, a spokesman for the Federal Reserve Bank of New York. So where is the Congressional scrutiny that should come when a primary supervisor fails to prevent these institutions finding themselves in a position where they need to take a combined $45 billion of taxpayer money to stay afloat, irrespective of when or if they pay it back? And yet as I noted in the White Paper yesterday, this entire mess has in fact been due to one and only one thing: The regulators in charge of the banking system allowed banks to write more in unsecured loans then they had in excess capital, resulting in hundreds of billions of dollars of loss that was shifted to the taxpayer, over $20 billion in direct losses taken by the FDIC, and over $2 trillion more in "direct and indirect support" by The Fed - all of which has become a taxpayer liability. Total housing starts were at 458 thousand (SAAR) in April, the all time record low. The previous record low was 488 thousand in January (the lowest level since the Census Bureau began tracking housing starts in 1959). Single-family starts were at 368 thousand (SAAR) in April; just above the revised record low in January (357 thousand). Permits for single-family units were 373 thousand in April, suggesting single-family starts will remain at about the same level in May. A Wall Street Journal Study of 940 Lenders Shows Potential for Deep Hit on Commercial Real Estate. Commercial real-estate loans could generate losses of $100 billion by the end of next year at more than 900 small and midsize U.S. banks if the economy's woes deepen, according to an analysis by The Wall Street Journal. That $200 billion is in addition to the $599 billion that the 19 stress-tested banks could face if the adverse stress test scenario comes true. Given the baseline scenario was more like a cake-walk than a stress test, it is reasonable to assume another $800 billion is going to be needed by banks. 58 banks have been seized since 2008, 33 of them this year. More are coming and the FDIC is preparing for them. The Federal Reserve reports that delinquency rates rose sharply in Q1 in all categories. Commercial real estate delinquencies (6.4%) are rising rapidly, and are at the highest rate since the early '90s (as delinquency rates declined following the S&L crisis). Residential real estate (7.91%) and consumer credit card (6.5%) delinquencies are at the highest levels since the Fed started tracking the data (since Q1 '91). Although there is credit deterioration everywhere, the rise in these three categories is especially significant. There was also a significant increase in C&I delinquencies (commerical & industrial). Note: The Fed defines commercial as "construction and land development loans, loans secured by multifamily residences, and loans secured by nonfarm, nonresidential real estate", and many of the problems are probably in the C&D loans. These are the loans that will probably lead to the closure of many regional banks. MEXICALI, Mexico — Census data from the Mexican government indicate an extraordinary decline in the number of Mexican immigrants going to the United States. The recently released data show that about 226,000 fewer people emigrated from Mexico to other countries during the year that ended in August 2008 than during the previous year, a decline of 25 percent. All but a very small fraction of emigration, both legal and illegal, from Mexico is to the United States. Mexican and American researchers say that the current decline, which has also been manifested in a decrease in arrests along the border, is largely a result of Mexicans’ deciding to delay illegal crossings because of the lack of jobs in the ailing American economy. The trend emerged clearly with the onset of the recession and, demographers say, provides new evidence that illegal immigrants from Mexico, by far the biggest source of unauthorized migration to the United States, are drawn by jobs and respond to a sinking labor market by staying away. It used to be easy to guess how many Americans would have problems paying their credit card bills. Banks just looked at unemployment: Fewer jobs meant more trouble ahead. The unemployment rate has long mirrored banks' loss rates on card balances. But Eddie Ward, 32 and jobless, may be one reason that rule of thumb no longer holds. For many lenders, losses are now starting to outpace layoffs. Mr. Ward, of Arkansas, lost his job at a retail warehouse in April and so far has managed to make minimum payments on his credit card debt, which he estimates at $15,000 to $20,000. Asked whether he thinks he will be able to pay off his balance, he said, "Not unless I win the lottery." In the meantime, he said, "I'm just doing what I can." Experts predict that millions of Americans will not be able to pay off their debts, leaving a gaping hole at ailing banks still trying to recover from the housing bust. The bank stress test results, released Thursday, suggested that the nation's 19 biggest banks could expect nearly $82.4 billion in credit card losses by the end of 2010 under what federal regulators called a "worst case" economic situation. But if unemployment breaches 10 percent, as many economists predict, the rate of uncollectible balances at some banks could far exceed that level. At American Express and Capital One Financial, around 20 percent of the credit card balances are expected to go bad over this year and next, according to stress test results. At Bank of America, Citigroup and JPMorgan Chase, about 23 percent of card loans are expected to sour. Even the government's grim projections may vastly understate the size of the banks' credit card troubles. According to estimates by Oliver Wyman, a management consulting firm, card losses at the nation's biggest banks could reach $141.5 billion by 2010 if the regulators' loss rate was applied to their entire credit card business. It could top $186 billion for the entire credit card industry. In the official stress test results, regulators published losses only on credit cards held on bank balance sheets. The $82.4 billion figure did not reflect another element in their analysis: tens of billions of dollars in losses tied to credit card loans that the banks packaged into bonds and held off their balance sheets. A portion of those losses, however, will be absorbed by outside investors. May 12 (Bloomberg) -- Advanta Corp., the credit-card issuer for small businesses, may leave 1 million customers scrounging to find new lenders and debt holders facing losses of 35 percent after the company shut down accounts to preserve capital. Advanta will cease lending June 10 after uncollectible debt reached 20 percent as of March 31, according to a statement and filings yesterday by the Spring House, Pennsylvania-based firm. The lender earmarked $1.4 billion to buy back securitized card loans with offers of 65 cents to 75 cents on the dollar. The Office of Management and Budget released a report yesterday on the budgets and proposed overhauls of Fannie Mae and Freddie Mac that included the possibility of liquidating their assets. But don't get your hopes up. The two government run mortgage finance companies have been scandalously costly for tax-payers, costing Americans far more in bailout money than they ever saved in cheaper mortgages. The OMB says that the two companies will need at least $92.2 billion more in fiscal 2010. This is on top of the $78.2 billion in aid they've received since they were taken over by the government in September. The entire point of having Fannie and Freddie operate as government sponsored entities was that they could borrow at lower rates than purely private companies. This savings enabled them to make mortgage loans at lower rates, and allowed them to buy up or guarantee mortgages from private lenders at rates that would otherwise have been uneconomical. Over the years, Fannie and Freddie may have saved Americans as much as $100 billion in mortgage payments. Now the OMB says they'll need that much just to get through next year. Just days after the state Legislature approved tax increases to help meet its budget deficit, the City Council is looking at a potential hike in property taxes. Dropping his push for a steep but temporary two-year increase in property taxes, Mayor Nutter yesterday agreed to back City Council's proposal for a five-year sales-tax increase to help close Philadelphia's $1.4 billion budget deficit. Phoenix's largest high school district will ask voters to extend a property tax that helps pay teachers' salaries and allows the district to offer more classes. The Phoenix Union High School District governing board has unanimously agreed to place a 10 percent override measure on the Nov. 3 ballot. MONROE -- Recently issued property revaluation figures came under fire Monday by owners angry that tax values have been set higher than sales prices in this depressed real estate market. George Puglisi, a Bagburn Hill Road resident, complained that his new assessment had risen 31 percent, compared to the townwide average of 21 percent. A total of $12.5 million will have to be raised through taxation to fund the budget, which means residents will see an estimated 2.3% municipal tax increase. On Monday, the Obama administration proposed $58 billion in new taxes in response to findings that returns from the original funding mechanism for President Obama's health care plan were overstated, the AP/Boston Globe reports (Ohlemacher, AP/Boston Globe, 5/11). May 11 (Bloomberg) -- President Barack Obama proposed raising money to pay for his health-care overhaul by imposing $58 billion in new taxes on securities dealers, life insurance products and Americans with valuable estates. The eight new proposals, outlined in budget documents released today, are in addition to more than $1 trillion in tax increases over the next decade the president wants to impose beginning in 2011. Nor are the "programs" trotted out by Obama (and his predecessor, to be fair) doing anything. We recently learned that "Hope for Homeowners" made a grand total of..... wait for it..... 51 loans. Senior federal housing officials say that of 51 loans made under the program, 50 were made by Melville, N.Y.-based Lend America, and those 50 loans are being held up pending ongoing federal investigations. The officials, who insisted on anonymity because they are not authorized to speak on the matter, declined to offer specifics except to say anything from inadequate documentation to unethical practices could be the focus of the queries. Remember, "Hope for Homeowners" was supposed to help four hundred thousand people stay in their homes. The net closed loan count is fifty one over a period of six months. Oh, and the reason for that article? The company responsible for 50 of the 51 loans is under investigation by The Department of Justice! I would like to be optimistic on the economy and thus, the capital markets. I refuse, however, to countenance and cheerlead for fraudulent "reporting" and false claims in the media in an attempt to prop up asset prices so that banks can issue stock into an overheated bubble market created through lies. CNNMoney is reporting Consumer credit falls a record $11.1B, more than three times analysts' estimates. U.S. consumer borrowing fell more than expected in March, plunging a record $11.1 billion, a Federal Reserve report showed Thursday. March consumer credit fell at an annual rate of 5.2% to a total of $2.55 trillion. This was the biggest percentage drop since December 1990. Non-revolving credit, which includes closed-end loans for big-ticket items like cars, boats, college education and holidays, dropped $5.7 billion, or at a 4.2% rate, to $1.6 trillion. Revolving credit, made up of credit and charge cards, fell $5.4 billion, or at a 6.8% rate, to $946 billion in March. This compared with a revised $9.7 billion drop in February. There is no way those loans can be all paid back, so they won't. Rising unemployment and falling asset prices seals the fate. No, no, this is not about anybody named John Galt or any book that Ayn Rand wrote. This is about the Hero of The American Consumption Revolution - a man much honored by the Chinese factory labor. That steely-jawed spending machine (let's just call him Tom Spendthrift) has flinched, and flinched hard. Consumer Credit (G.19) for March just came out. On an SA basis, revolving credit notched up a nice set of negatives for the last half of a year: -6.2% in Q4 08 and -6.5% in Q1 09. For March (these figures are preliminary) revolving credit is reported as -6.8%. To understand what this MEANS, my geeky, nerdlike friends, one must know that outstanding revolving credit (mostly credit cards) is reported at 931.9 billion at the end of March. At the end of 2007, outstanding revolving credit was 969.9 billion, and at the end of 2006, it was 902.3 billion. At the end of 2008 it was 992.3. Outstanding revolving credit grew at about 330 billion from the end of 2004 to the end of 2007. However people actually charged far more - during this period many people refinanced their homes and paid off their credit cards, then bounced joyously off to start the whole cycle again. But last year, the boom lowered. Cashout mortgages are now viewed with some considerable disdain. You can cash out all right, but you need to have some substantial equity in your home to do so, and that's not the case for many of these rolling refi customers. So even in 2008, consumers were far more conservative with those cards. Then the Obama administration. Back in February and March I pointed out that the Obama administration's stupid banking tricks act had just blown the recovery. There are multiple moving parts to this dioxin-on-the-green-shoots drama, but imposing a stress test at the same time that accepting government money was going to be used to curtail actual banking executive remuneration equated to applying a cattle prod to the rear of the big banks, who control most of the credit card industry. Combined with rapidly rising unemployment, the result was going to be ugly for Bernanke's lovingly nurtured garden of green shoots. There is actually justification for this, based on expected and observed charge-off rates. Your FICO means nothing if you lose your job and end up running up your CCs to pay for living expenses. Such credit cards are going to be mostly write-offs with or without bankruptcy. In order to detect such impending chargeoffs, the big credit card issuers have adopted a range of techniques to detect people who seem to be using their credit cards to offset a major drop in income. Buy with your CC at WalMart? You may find your credit limit cut. Charge groceries? The same. If you don't usually carry a balance, there have been wholesale cuts in credit limits almost across the board. So Americans have decided to pay off their bleeping debts. There is another cohort of people who had been resting comfortably with relatively little cash on hand although comforted by the idea that their available 30K-50K on credit cards could see them through a period of unemployment. Most of those people just got their credit limits cut in half over the last few months. If you don't have rolling balances, the CC line managers do not look at a sudden doubling of your outstanding credit with favor. They know what it means - that you are suddenly out income, probably out of a job, and are now likely to run up 10-15K in CC debt and default on the bulk of it. What's the total effect on the economy? Well, probably there will be a net subtraction of far over 100 billion a year compared to recent years. If people are paying down their credit card debts from income, not only are you out the amount of spending they would have put on credit cards, but you are out the amount of spending that they divert to pay those puppies. Second, people who have relatively high incomes but have in recent years considered their emergency savings fund to be their HELOC and CC credit limits are being reeducated to save. So they, who could continue spending, are now drawing back on the spending to put a few months worth of expenses in the bank. This is quite rational, and will bear fruit in future years. The debtloaded consumer has to unload before he can continue funding a Chinese expansion. The real amount charged but not paid from income in the boom years was far higher than the 330 billion I cited. That's because a lot of the debt was rolled into refis based on ever-growing home values. In short, a lot of consumer spending was funded by the transitional method of credit cards but really paid for by Mortgage Equity Withdrawal, or MEW. Look for another grim employment report on Friday, perhaps in the range of 400,000 to 700,000 jobs lost. This will be the 16th consecutive months of jobs lost with no end in sight. WASHINGTON (AP) -- Unemployment rates rose in all of the nation's largest metropolitan areas for the third straight month in March, with Indiana's Elkhart-Goshen once again logging the biggest gain. The Labor Department reported Wednesday all 372 metropolitan areas tracked saw jobless rates move higher last month from a year earlier. Elkhart-Goshen's rate soared to 18.8 percent, a 13 percentage-point increase. That was the fourth-highest jobless rate in the country. The jobless rate jumped to 17 percent in Bend, Ore., a 9.2 percentage-point rise and the second-biggest monthly gainer. Rounding out the top three was North Carolina's Hickory-Lenoir-Morganton, which saw its unemployment rate rise to 15.4 percent last month, an increase of 9.1 percentage points. Fallout has been especially pronounced in the manufacturing, construction and retail industries, which have suffered heavy layoffs. El-Centro, Calif., continued to lay claim to the highest unemployment rate -- 25.1 percent. The jobless rate there is notoriously high because there are so many unemployed seasonal agriculture workers. Following close behind were Merced, Calif., with a jobless rate of 20.4 percent, and Yuba, Calif., at 19.5 percent. The national unemployment rate soared to 8.5 percent, a quarter-century high, in March. In Wednesday's metro unemployment report, the government said 18 regions registered jobless rates of at least 15 percent. Meanwhile, 15 regions had rates below 5 percent. They include: Ames, Iowa; Houma-Bayou-Cane-Thibodaux, La. ; Iowa, City, Iowa; Manhattan, Kansas; and Lubbock, Texas. Sales fell to $3.5 billion from $4.9 billion as tire unit volume dropped 20%. Steep declines in auto productions hurt sales to manufacturers at the same time as demand for replacement tires has also suffered due to the weakened economy. "Our markets presented us with the challenges we expected in the first quarter, and in some cases more," said Chairman and CEO Robert Keegan. "While we aren't satisfied with our results, they generally reflect the difficult market conditions. The company cut 3,800 jobs during the period and slashed inventory more than $300 million below the year earlier level. The world's slumping car market also took a heavy toll overseas where European tiremakers Continental AG and Michelin SA both posted double digit sales declines. Pfizer reported a 2 percent decline in first-quarter profits on Tuesday, to $3.7 billion, and an 8 percent decline in revenue, to $10.9 billion. While more than half the revenue decline came from the effect of a stronger dollar on overseas sales, company officials and analysts said, the profits fell in response to generic competition and weakening demand for some of Pfizer’s leading drugs. Revenue from power sales was down on lower demand caused by the recession, which has forced mines in the northern part of the state to shut down or curtail operations, while casinos and hotels in the southern part of the state have seen business down as much as 20%, leading to less energy use by commercial and industrial customers as well as residential customers, company executives said. Methanex Corp. (MEOH) posted a first-quarter loss due to weaker demand and lower methanol prices. Revenue plunged 65% to $254 million. The company also had a tough fourth quarter, with the global economic slowdown hurting methanol demand and triggering a write-down in the value of the company's inventories. NEW YORK (Dow Jones)--Valero Energy Corp. (VLO) said U.S. gasoline demand has risen slightly this year, while domestic diesel demand has declined. Valero, the largest U.S. oil refiner, owns and operates gasoline stations across the U.S. Valero has observed a 10% decline in diesel demand at its U.S. retail stations, Valero Chief Financial Officer Mike Ciskowski told analysts on a conference call following the company's release of first-quarter earnings Tuesday. Gasoline demand has increased 1%, he said. Praxair Inc.'s (PX) net income fell 7.5% on sharply lower demand for industrial gases used in the slumping chemicals and semiconductor industries, but margin gains largely offset the revenue woes. Chairman and Chief Executive Steve Angel said the demand drop has largely been stabilized, but volume is down 12% from prior-year levels. "However, we have not yet seen meaningful signs of recovery and we are therefore cautious regarding our outlook for the remainder of the year. American Tower Corp.'s (AMT) first-quarter net income jumped 39% as the cell-tower operator reported continued demand to put new antennas on its facilities. Cell-tower operators have benefited from volume increases, which has prompted wireless carriers to spend more to upgrade their equipment. In response to the growing demand, the operators are constantly investing capital into new projects. American Tower, for example, said last week said it wants to strengthen its presence in India, as it plans to enter other Asian markets. American Tower noted that the currencies in Brazil and Mexico are so far weaker than what American Tower was projecting for the year. If current rates are sustained, it would impact 2009 expectations by around 1%. MeadWestVaco Corp.'s (MWV) first-quarter loss widened on falling margins and a lack of demand for its products as the packaging and specialty chemicals company said it was making progress on its job- and cost-cutting plans. MeadWestVaco has been struggling with higher input costs, lower volume in its consumer and office products business and weakening demand in packaging markets amid the recession. Both the packaging and chemicals businesses are highly cyclical, and both industries are suffering amid the worsening economy. Anyone that calls for a rebound while demand is shrinking, and unemployment is rising is either extremely ignorant of economics or a liar - you be the judge. It doesn’t take a rocket scientist to deduce that the banking and financial services industry has an outsized influence in Congress. Wells Fargo, Citigroup and JP Morgan Chase each got bailouts of $25 billion in government bailouts last year. Morgan Stanley and Goldman Sachs got $10 billion apiece. And AIG, the mammoth insurer that lost billions in bad derivatives bets, has sucked in more than $170 billion. Meanwhile, President Barack Obama is reticent about bailing out an American state — California. Collin Peterson, Democratic Chairman of the Agriculture Committee, says he knows who to blame.